This review we’re doing to cover another bidet toilet seat where this one comes with a Pre-mist setting. I will explain what that is in a minute. This one is the TOTO SW2044#01 C200 WASHLET Electronic Bidet Toilet Seat with PREMIST and SoftClose Lid. We will run you through the features of the seat and take a look at the reviews of customers that have purchased and see what their true opinions are both good and bad. 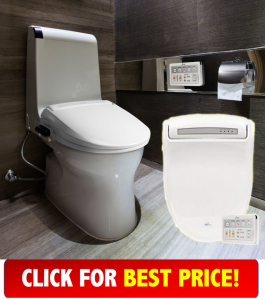 I will run through what you exactly get with this electronic bidet toilet seat, tell you the pros and cons and of course where you can purchase this great electronic bidet toilet seat from. If by chance you landed on this page and you just want to purchase the Toto Washlet c200 then just click on the link >> click here and go straight through to Amazon.com where you will be able to see the full product page and you will also be able to see the price as well as what people are saying about this product. 4 What is PREMIST & what does that have to do with toto washlett c200 toilet seat? Once upon a time in a far far land when we went to the toilet, it was a mundane trip, right? 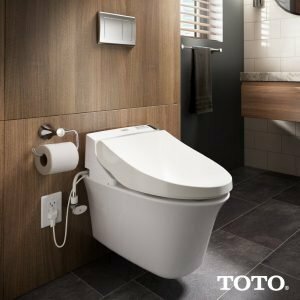 The Toto washlet c200 is a luxury electronic bidet toilet seat that cleanses ya personal bits with warm water. There are 5 different temperatures and water pressure setting to suit your own liking. Unlike when using toilet paper which can be rough, ineffective at times and painful too even. Cast back to that day when you last had the runs, remember? Well with the c200 washlet provides a nice warm comfortable water cleanse at a push of a button. The TOTO SW2044#01 C200 WASHLET Electronic Bidet Toilet Seat with PREMIST and SoftClose Lid has both front and rear warm water cleanse wands that are self-cleaning before and after your cleansing. C200 WASHLET model was specifically designed to enhance cleanliness and provide the ultimate in comfort. Designed and created with the highest quality materials to ensure that it’s durable and longevity to you is assured. Easy to install should on average take around 30 minutes max for the average DIY’er. It comes with all parts and attachments for a complete and easy install. You may need extension lead for power if you don’t have power close to your toilet now. Comes with a remote control so you can either have it hand-held or mount it to the wall and you can set it to have your very own cleansing settings programmed in. 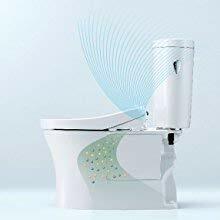 For those winter days and nights, this electronic bidet toilet seat comes with a heated seat for ultimate comfort and Non-slamming soft close toilet seat and lid. What is PREMIST & what does that have to do with toto washlett c200 toilet seat? I like the idea for sure. We’re all guilty of em…yep Skidmarks. Well, what the premist does is it spays a mist inside the toilet bowl area before each use. This creates a slick surface area helping to prevent waste “skiddies” sticking to the bowl. Saves on cleaning time too☺. Premium features help create a more pleasant and hands-free experience for users. The automatic air deodorizer neutralizes bathroom odors by using powerful filters and effectively cleaning the air around the toilet. Enjoy the ease and comfort of drying with the temperature-adjustable warm-air dryer. The TOTO SW2044#01 C200 WASHLET Electronic Bidet Toilet Seat with PREMIST and SoftClose Lid comes in two models. Round and elongated. Below are the dimensions and how to measure your toilet to see which you need. For those who need around toilet seat, hate to say it I’m sorry. They are currently unavailable and as soon as I find out if or when they come back I will post it on here so make sure you keep checking back over time for updates. The spay is a bit to jet-like, but I’m sure they have adjusted this now on new models. Other than that i”m pretty happy with the reviews and results of the washlet c200. 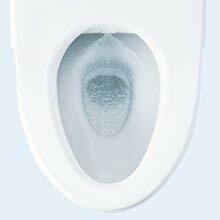 The overall customer opinion of the washlet c200 bidet toilet seat is great. With 350+ reviews on Amazon.com with mainly 4 and 5-star rating I think this is a good choice. There are a few bad reviews and they all seemed to around tech support or missing parts. Overall we don’t think you should worry about a few bad reviews as overall it has a 4.1-star rating. Check it out below and get yours now before they’re all gone.